What if you accepted everything that came your way as if it were a gift from the Universe? What would your life look like, if you made this your daily practice? Imagine being thankful for the cold you got, that slowed you down enough so that you could rest. Imagine responding to a diagnosis of illness with a palpable peace. You’d be able to make decisions for yourself with much more clarity. We resist unpleasant things to protect ourselves from what we perceive as bad or threatening. Because of our judgment of the experience as bad and something to resist and fight, we suffer fear in the process. We may then try to cure, medicate, or numb ourselves, as long as the pain and the fear wrapped around it go away. What if we chose to accept what happened to us instead? During a time of sadness or chaos, have you ever experienced the feeling of having everything work out, as if it were orchestrated for you to learn an important life lesson? This is not a random occurrence. This is the Universe working on your behalf. You can experience this more and more, through a basic attitude change. Complaining is a victim’s game, and it doesn’t feel good. Consider the idea that you can regain your personal power through acceptance. 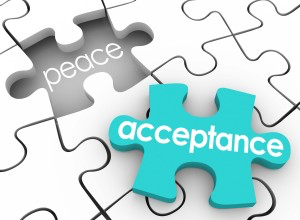 With practice, acceptance can become a bigger part of your life. Work on developing the habit of being grateful for all your life experiences, as if you chose them. And imagine how you can glean the wisdom of your unique past through this process. What I’m describing is not a departure from seeking medical care when it’s needed. It’s a mindset. It’s a way of seeing your world that is helpful and health inducing. And it works. Your body is a finely-tuned antenna for what is happening in your psyche. It can even alert you to when an emotional upset is skillfully buried deep within the mind. Your body can help you in your quest to live a full life and accomplish your goals and dreams. When you respect your physical and emotional processes, you give yourself space to heal. And more importantly, this acceptance heals the heart.